Our roof cleaning, equipment and products give brilliant results. We’re sure to satisfy with our ability to clean all standard roof types including terracotta, cement tile, tin, colour bond and copper. All work is conducted strictly with OH&S in mind – harnesses are used and safety procedures are followed. If a boom lift (cherry picker) is used, the operator is always licensed and harnessed. To give your house an instant face lift contact Pressure and Steam for a free quote. We service the Northern Beaches, Upper and Lower North Shore, Eastern suburbs and the Inner West. 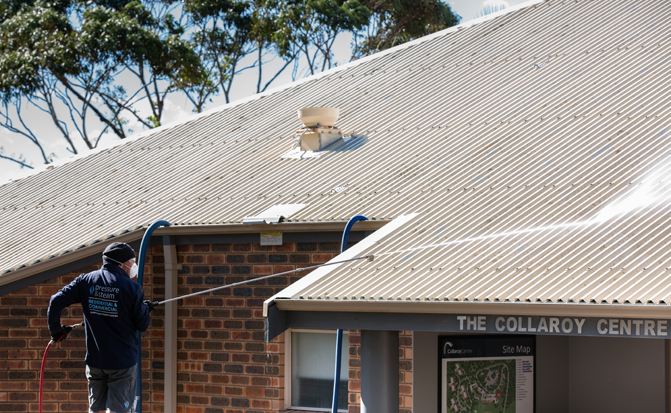 Before we start roof cleaning we’ll ensure that the roof is watertight. Tiles may be replaced using spare tiles provided by you. If required, we apply an anti-fungal treatment, which is non-toxic and biodegradable. This may also be done after to ensure longevity of the clean. Gutters are cleaned and rinsed down if they have already been emptied. Full gutters will be quoted as extra. Any areas that have been sprayed by dirt and debris are rinsed down ensuring that all surrounding areas are left as clean or cleaner than before. Colour bond roofing should not be cleaned at high pressure. Many other roof cleaners use high pressure for colour bond roof cleaning but this is not recommended by the manufacturer and you’ll risk voiding your warranty. We apply a powerful chlorinated detergent with anti-mould and anti-bacterial action for an outstanding clean that also gives long lasting results. We rinse the roof with warm water at medium-pressure not exceeding 1000 PSI to prevent damage. Using higher pressure will void your colour bond warranty. Any areas that have been sprayed by dirt and debris are rinsed ensuring that all surrounding areas are left as clean or cleaner than before. Our team is professionally trained and observes strict safety measures while cleaning your roof. The head technician working on each roof cleaning job has completed vocational training at ITI.